Sandhill Cranes taking off from the river. Photo by Roger Schliefert. It’s 10 degrees below freezing, a light dusting of snow covers the ground, and it’s 6am. The blanket of fog, so thick I couldn’t see more than 5 feet in any direction on the drive through the country roads of Nebraska, is slowly lifting and I can see the stars. I’M AT ROWE Sanctuary walking towards the Iain Nicolson Audobon Center, and I expect the muffled silence of the pre-dawn in the countryside, but instead there’s the chatter of thousands of voices. The cranes are restless. “The water is high, and there were more birds arriving over night. That’s why they’re so noisy this morning,” says Sil Pembleton. Sil is a long-time volunteer at Rowe, and she is one of the leaders taking me, with about a dozen others, along a trail lit only by the occasional small red light out to the blind along the Platte River. We have come here, in the cold, cold early morning with black electrical tape over the flashes of our cameras and binoculars in hand, to see the sandhill cranes, one of the world’s oldest birds and a species that makes one of the world’s most impressive migrations. Every year between mid-February and early April, thousands upon thousands of sandhill cranes, around 80% of the world’s total population, make their way to this small stretch of the Platte River in south central Nebraska. Coming to this staging area from New Mexico, northern Mexico, and Texas, the cranes will stay here for about a month to fatten up before heading to their nesting sites in Alaska, Northern Canada, and some as far away as Siberia. During that month, they spend all day eating waste corn from fields, crustaceans, worms, and snails, putting 2-3 more pounds on their 3-4 foot frames. At night, they roost along the river on sandbars and in the water itself, up to depths of 6 to 8 inches or so. The water acts as an alarm, warning them if predators are on the way. 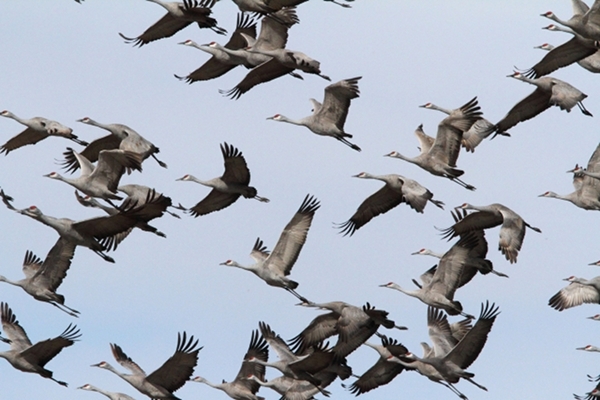 Historically, the Platte “was a mile wide and an inch deep,” which makes it the perfect site for the cranes to rest and eat during their annual migration. But a wide and shallow river isn’t ideal for farming and development. Over 150 miles of river channel have been lost, and only about 4.5 miles of the river lie within the protective boundaries of the sanctuary. Rowe is dedicated to conserving the Platte River ecosystem and educating people about the area. Their work involves, among other things, removing non-native species of plant life, restoring crop land to native prairie and wetlands. And the area isn’t just home to sandhill cranes, though that is the most spectacular population supported there, endangered species including the whooping crane and piping plover rely on the Platte River Valley habitat. Established in 1974, the land for the sanctuary was purchased from the Tripplet’s, local farmers. Ron Klataske, currently the Executive Director of Audobon of Kansas, came by the farmhouse over and over, talking to the farmer and his wife, trying to get them to sell the land. According to Sil, Mrs. Tripplet eventually told her husband that he’d still be able to walk along banks and enjoy the views, but she was tired of chasing the cows out of the river. If the land was sold, the buyers would put up a good fence. The Tripplet’s were well-respected in the community, and when they sold part of their land, other farmers were more receptive and open to the idea of selling, and the center has grown from 728 acres to nearly 1900 acres. Feeding and dancing in the corn field. Photo by author. 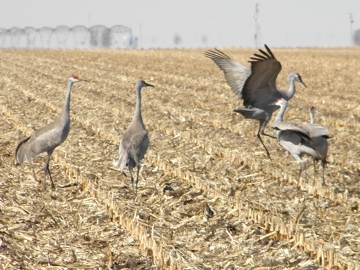 Around 15,000 people will flock (pun intended) to the area to see the migration, and volunteers are needed throughout crane season. This year, around 27-30 volunteers from across the country along with 45-46 locals will be helping to run the sanctuary, doing everything from manning the cash register in the gift shop to leading the twice daily tours out to the blinds. If a volunteer works for two weeks at the Sanctuary, then his/her accommodation is covered, and many of the volunteers are there for weeks at a time. The camaraderie and passion for the cranes is obvious in the volunteers, many of them retired and most of them seem to be women. I asked Sil about this. “There are more and more men volunteering, but I think that women are nurturers. Men are more conquerors.” It made me think of the gender assignments, at least in western culture, of Mother Nature/Earth and Father Time. In the visitor’s center, a feature is the Crane Cam. Set up originally by National Geographic, the camera streams live footage of the river, and visitors can zoom or pan the camera with a joystick to get the best views. There are wildlife viewing areas, a gift shop, and educational exhibits. One of the exhibits shows the Platte River just over 100 years ago, when the river wasn’t dammed and the seasonal floods would clear off the sandbars each year, leaving them clean for the next season of cranes. But with the widespread use of irrigation and dams, the spring floods don’t happen anymore. And cottonwoods and other vegetation that grow along the banks or in the river cut down the crane’s habitat. So what nature would do, Rowe now helps organize. Each summer, contractors come in with heavy machinery to clear off the riverbed in the Sanctuary, ensuring that the next year, the cranes will have somewhere to roost. Water is a precious resource in the Great Plains. Nearly everyone I spoke to about the river, including Roger Jasnoch, my host from the Kearney Visitors Bureau and Bill Taddicken, sanctuary director, mentioned the Mark Twain quote “Whiskey is for drinking; water is for fighting over.” There’s always pushback over water with competition between agricultural irrigation, industry, and municipalities. Nebraska has battled neighboring states for water rights for years, with a large victory in 2006 with the signing of the Platte River Recovery Implementation Program Agreement. The 2012 President’s budget request for the program is $11.0 million; Ken Salazar, United States Secretary of the Interior, was touring the Platte River area this March. The program combines the forces of the federal government, Nebraska, Wyoming, Colorado, various environmental groups, and water consumers to work together to protect and enhance the river and wetlands. In the blind. Photo by author. Standing in the blind, a large wooden building with about two-dozen windows at alternating heights, I can see a group of at least a hundred cranes standing just about 50 feet into the river. The silhouettes of their bodies are reflected in the water in the pre-dawn light. The sun begins to rise, and what seemed like indistinct black shapes become defined grey and tan bodies with the distinctive red patch. I can see more and more groups along the river. Each had hundreds, possibly thousands, of cranes. The spectacle is one to be heard as much as seen. The cranes seem to be almost constantly communicating with a distinct bugling and trilling sound that is both high-pitched and guttural. Hundreds of thousands of birds are calling to each other with vocalizations strong enough to be heard up to a mile away. We stand there, not talking, for two hours in the blind. It’s seeing nature; the cranes are going about their business, we’re just there to watch and appreciate. When a bald eagle flies low over the river, the cranes take off, seemingly as one. In flight, the feathers on the underside of the cranes glow golden in the sun. And in the river, many of them dance. They might be nervous and anxious, needing to release some energy. It’s also important for pair bonding; the cranes mate for life. Or sometimes it’s just for the joy of being there. I’m back at home now and it’s nighttime, but I have the Crane Cam playing in the background, and I can hear them talking. Just now I can tell by the change in the tone of their calls that something has scared a group and they’ve taken off. And I close my eyes, and I can see them dancing. 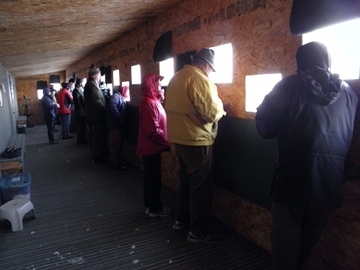 During crane season, you can take a sunrise or sunset blind tour for $25, or arrange to stay overnight in a photo blind built into the banks of the river for $100+. The sanctuary and visitor’s center is open year-round with educational programs and walking trails. If you can’t make it to Rowe this spring, you can watch the Crane Cam. The best time to watch is between 7:30 and 8:30am CST and 7:00 and 9:00pm CST. Click here to donate to Rowe Sanctuary. Watch (and hear!) the cranes on the Platte River in the morning below. If you can’t get enough of wildlife conservation, check out How to Become a Wildlife Biologist. And for more on birds, there’s 10 Birding Hotspots.